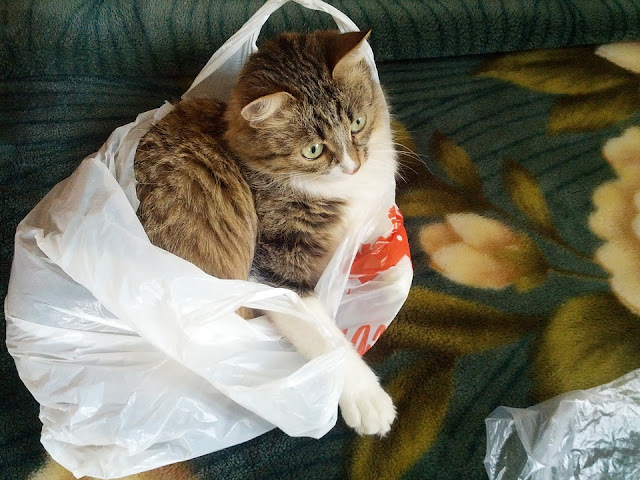 Have you ever noticed that some cats just love plastic bags? They chew them, lick them, and rub against them, but their love can be dangerous! Even if your cat isn't interested in plastic, be sure not to leave any bags laying around. 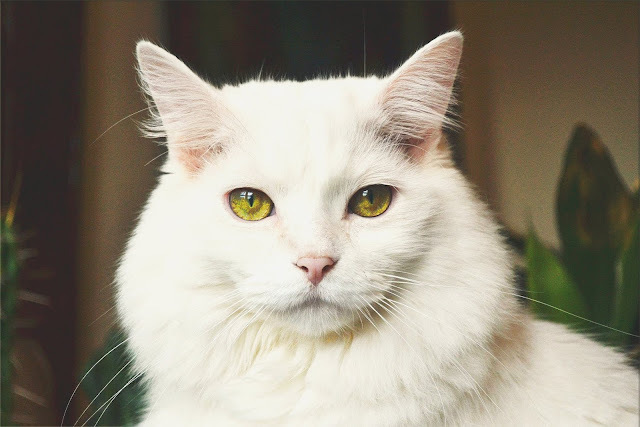 When unattended, a cat can eat enough plastic that it gets stuck in their stomach which creates an intestinal blockage and requires surgery. If that's not the worst, they can suffocate and get strangled by the handles too. So what's the attraction to plastic bags? Do you remember my blog about Kitty Noses? A cat's sense of smell is VERY strong. They can smell things even dogs can't smell! That's the first problem. Just look at that little nose. -Some plastics are treated with lubricants so they don't stick together. Plastic can have lanolin, stearic acid derived from tallow aka animal fat, or fish oils in them. Of course this is attractive to a carnivore! -With all the chemicals in plastic, some plastics may give off a scent that mimics pheromones. 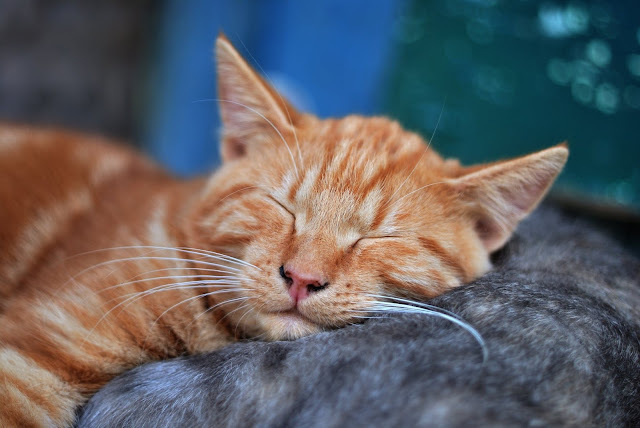 If your cat sniffs the plastic and makes an open mouth face or if you find your kitty peeing on your plastic bags, they probably smell a scent similar to another cat. - A few of the new biodegradable bags are being made with corn starch which smells and tastes good to some cats. -One of the things a bored, nervous, or OCD cat will do is eat things they shouldn't. Sometimes they crave things they shouldn't. This is linked to pica. Pica is when cats will eat or chew inedible objects. They may chew on wool sweaters or eat litter, but can opt for plastic shower curtains and shoe laces. If you know your cat is a plastic licker try to curb their exposuree to the plastics they like or plant kitty safe plant grass. Cats are playful and enjoy toys with texture and sound. Crunchy toy and kitty. (I don't know if the ball is really crunchy, but it looks crunchy. 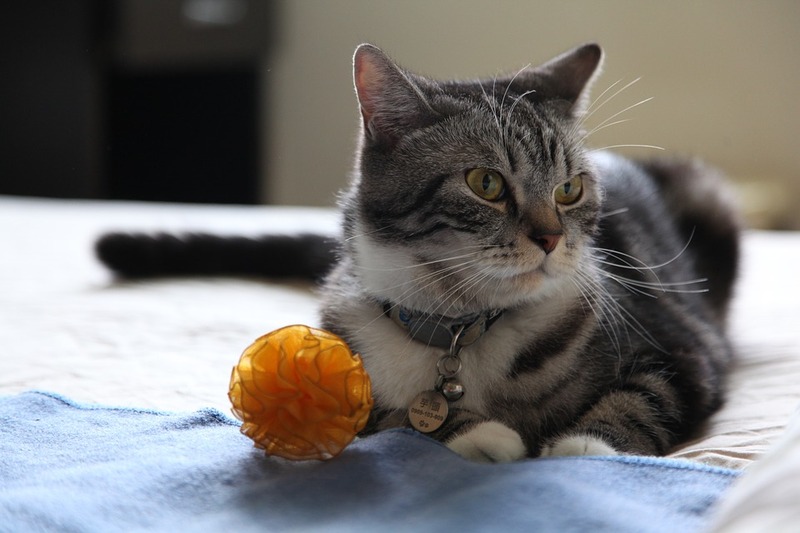 -Bags crunch and make the same sound as their favorite cat toys. Plastic bags feel like a toy, so they must be a toy right? Nope. Not a toy. Just say no, even if they want to wear that plastic bag like a Count Dracula cape! This should have a warning for cats and dogs too. Better safe than sorry.